Cognitive Dissidence: It's A Big Club and You Ain't In It! Fourth of July weekend, and everyone gets together with their friends and likes to have a nice cookout, maybe some Spotted Cow and a burger. It is always good to take a couple days and relax with friends. The members of the Bourgeoisie did just that. 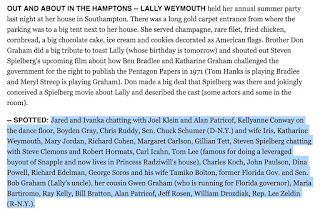 Lally Weymouth, the former owner of the Washington Post and currently a senior associate editor there, held her annual summer party. Being owned by Jeff Bezos has its privileges. 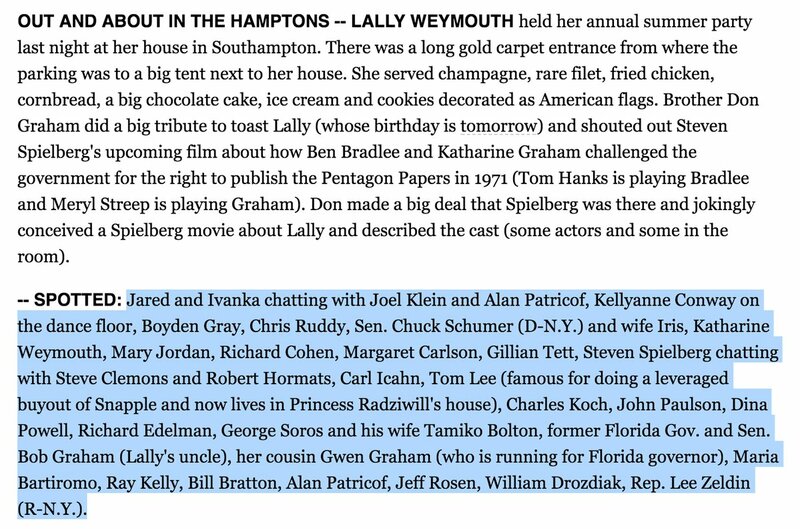 Ms. Weymouth, at her house in the Hamptons, entertained with a long gold carpet leading to a big tent put up next to her house, where the guests were served, champagne, rare filet and a big chocolate cake w/ice cream (among many other delicacies). Ms. Weymouth, whose birthday was the next day, would of course, know many people in Washington D.C., since her grandmother bought the Washington Post many years ago. 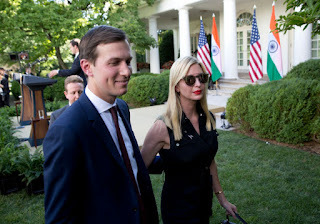 Yes , fresh from their offices in the White House, where their father continually calls any mainstream media that criticizes him #fakenews, here are Jared and Ivanka partying with a senior editor of the Post. Ok it could just be a random thing, but as we all know --- But Wait There is more!! A quick peak at the guest list and who do we see? Joel Klein: Former Chancellor of the New York City Department of Education; then Executive Vice President of News Corps. ; now an executive at New York-based health start-up Oscar. Alan Patricof: Investor; founder and chairman of New York Magazine; a Democrat who supported Hillary Clinton, though he often lunched with Young Jared Kushner. Boyden Gray: Former counsel to President Bush and a main architect of the Clean Air Act; former ambassador to the E.U. Chris Ruddy: CEO of Newsmax; Trump confidant. Katharine Weymouth: The former publisher of the Washington Post; daughter of Lally Waymouth. Richard Cohen: Washington Post columnist. Margaret Carlson: Bloomberg News columnist; the first female columnist at Time. Gillian Tett: U.S. managing editor of the Financial Times. Steve Clemons: Washington editor-at-large of The Atlantic. Robert Hormats: Vice Chairman of Kissinger Associates. Charles Koch: One half of the infamous Koch brothers and CEO of Koch Industries. John Paulson: An investor and one of Trump’s top economic advisers during his campaign. Dina Powell: The U.S. Deputy National Security Advisor for Strategy to Trump, evidently hand-fed to him by Mika Brzezinski. Richard Edelman: Founder of the PR firm Edelman Group. Maria Bartiromo: Anchor at FOX News. Ray Kelly: Former Commissioner of the NYPD. William Drozdiak: A non-resident senior fellow at Brookings Center of the United States and Europe; senior advisor for McLarty and Associates. Steven Spielberg is there too, unfortunately for him. Nothing like getting hard hitting news coverage from a paper of record after a night of the editor and reporters partying with all of the major players. While families have been split over the current political climate, the people behind the scenes are eating rare filet and toasting to your foolishness. When George Soros and Chuck Koch are toasting together, or Chuck Schumer and Jared Kushner are sharing pleasantries over bacon wrapped scallops and billionaire investors from both The Donald and Hillary are sharing stories of their multiple divorces, all at a party of the editors of the Washington Post....then we know the whole thing is a sham. In the end we just turn into Spiculus, fighting for the Emperor Nero's enjoyment. Chris Christie's recent solo beaching shows what the Plutocracy thinks of the American People. You ain't in the club. Very bad optics for Schumer and press.